Yesterday was the sixtieth anniversary of the plane crash that killed Buddy Holly, J. P. Richardson ("The Big Bopper") and Richard Valenzuela ("Ritchie Valens"). 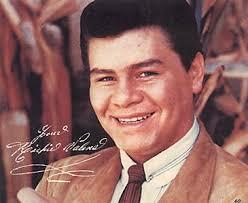 Valens, 17, had three hits, the biggest being "La Bamba." 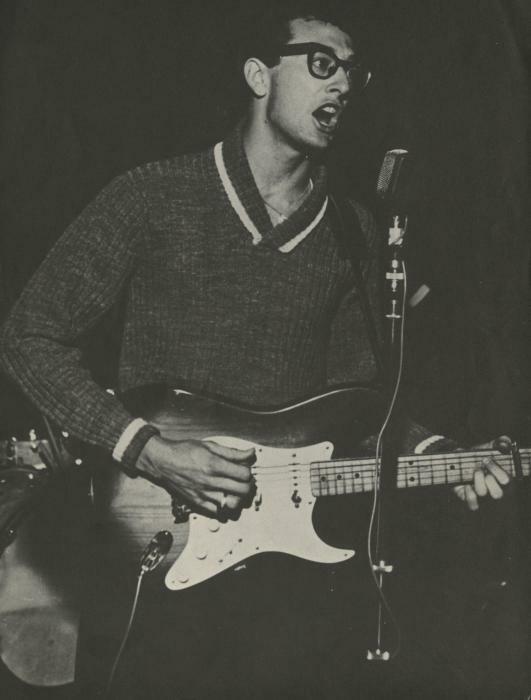 In the 60s, dozens of Midwest bands covered his "Come On, Let's Go." The McCoys had a local hit with it. Their lead singer and guitar player Rick Zehringer, AKA Rick Derringer, went on to do session work for Steely Dan and Bonnie Tyler and play behind both Edgar Winter and his brother Johnny. Richardson's only hit of note was "Chantilly Lace," but he also wrote "Running Bear," a posthumous #1 for Johnny Preston, and "White Lightning," the first chart-topper for country giant George Jones. Not so with Charles Hardin Holley. A year or two ago, another guitar player I know said, "I could never get the fuss over Buddy Holly." Four other players around the table chewed up one side of her and down the other in less time than it takes to say "Peggy Sue." Holley (Or, professionally, Holly) was the Real Deal, only 22 when he died, younger than Mozart or Schubert. I still have a six-LP box set of his stuff released around 1980 (Much of it has never appeared on CD; I've considered burning it to CD myself), and it contains a staggering 122 tracks, NOT his complete output! A few are demos or interviews, and a few songs show up in different arrangements, but think about it for a minute. When the Beatles made their first recordings for EMI, John Lennon, 23, was the oldest member of the band and they performed mostly covers. 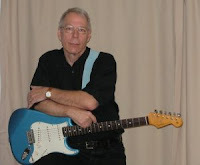 The youngest of four children, Holly heard his family play guitar, piano, banjo, mandolin, and who knows what else. They all sang, some professionally, and he heard country, jazz, blues, western swing and gospel music regularly. The kid was a walking melting pot and won a prize for performing on his toy violin...at age five. He was performing regularly before he could shave. As Buddy Holly and the Crickets or with solo billing, he wrote or co-wrote a slew of rock standards: "Peggy Sue," "That'll Be the Day," "Heartbeat," "Oh Boy," "Rave On," "Everyday," "You're So Square," "Words of Love," "Not Fade Away," "It's So Easy," "Well, All Right," and several others. His combo of second guitar, bass and drums invented the rock band template. As John Mellencamp once said, "Listen to the Beatles early records. Take off the vocals and the sound is Buddy Holly." Holly's style incorporated chords and simple riffs off those chord shapes to build solos that were melodic and rocked like a jeep on a mountain road. They were simple, logical and perfect. He's as vital to the development of rock 'n' roll guitar as Chuck Berry, who was ten years older. I perform lots of blues and folk and sixties rock, but I also play Holly songs because every time I look at a new one, I learn something. I've even used two of his titles for stories (Both currently looking for publishers). His influence on the British Invasion? The Crickets inspired The Beatles, who covered "Words of Love" on an early LP with George Harrison doing a note-for-note copy of the original. Who can blame him? It's a great riff, and I copy it, too. 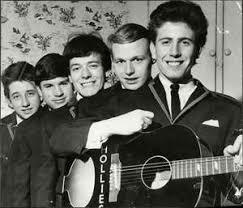 Graham Nash formed a band called The Hollies. Oddly, although they covered dozens of rock standards by Chuck Berry, Roy Orbison, various R & B acts and other British bands, I can't find a single Buddy Holly Song on their records. But you can hear Holly's influence in those shimmering harmonies. The Rolling Stones covered many American R & B And blues acts, and their first single was actually written by John Lennon and Paul McCartney. But the "A" side of their first American single was Holly's "Not Fade Away," and it benefits from the punchier production, possibly because of somewhat better recording technology than Holly's studio had in 1957. Linda Ronstadt covered "It's So Easy" and "That'll Be the Day." Blind Faith, the short-lived experiment with Eric Clapton and Steve Winwood, recorded "Well, All Right." Holly booked that fatal plane to move his band to the next gig because their tour bus kept breaking down on snowy roads in the Midwestern winter. 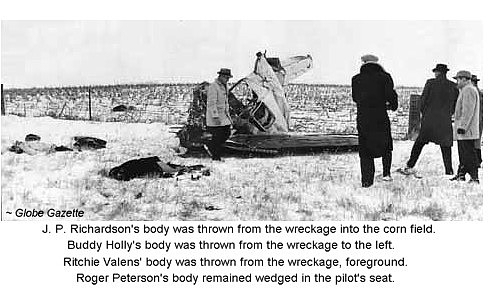 When Valens and Richardson found out about the plane, they begged Holly's band mates to give up their seats. 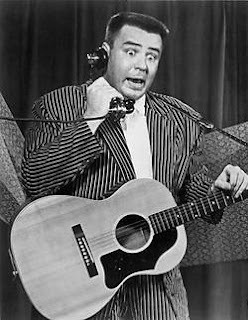 Second guitarist Tommy Allsop "lost" a coin toss and surrendered his seat to Valens. Richardson took the seat intended for a lucky bass player who went on to carve out his own legendary country career: Waylon Jennings. Sixty years ago yesterday. If things turned out differently, Holly could still be alive at 82, a year and a half younger than Elvis and four years older than John Lennon. 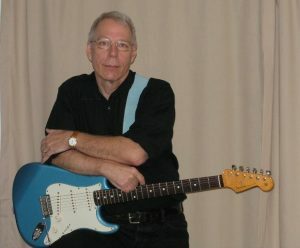 He probably wouldn't be doing oldies shows, but he'd see what he started with his '58 sunburst Fender Stratocaster. Good stuff never gets old.